The former CEO of National Public Radio came back from a reporting trip on conservative America having changed his mind about the efficacy of gun control measures, he said on Tuesday. 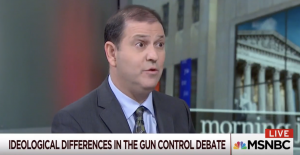 Ken Stern appeared on "Morning Joe" to discuss his new book, Republican Like Me: How I Left the Liberal Bubble and Learned to Love the Right. Stern, a Democrat, wrote he realized he was cordoned off in a liberal bubble and set off into conservative enclaves of America to expose himself to new ideas. Co-host Willie Geist asked him if he altered his views on any key issues as a result of the book. Stern said he had changed them on guns, and it began with a notion he hadn't thought of before: that gun homicides have declined significantly over the past 25 years. "The most extraordinary trend in modern American criminal history," Stern said. "At the same time, the number of guns have gone up. Those two things aren't correlated, but it's clear we know how to drive down gun murders without gun control, and the question is why are we talking about gun control when there's other things that we've been doing for 25 years that actually have reduced murders in this country by an extraordinary amount." Stern could have learned that gun homicide deaths had declined simply by reading the Washington Free Beacon, however. In an editorial printed in the New York Post, Stern criticized the media for being roped off from understanding America, saying, "the media should acknowledge its own failings in reflecting only their part of America. You can’t cover America from the Acela corridor, and the media need to get out and be part of the conversations that take place in churches and community centers and town halls."